Fluency practice: What do you know about Britain? 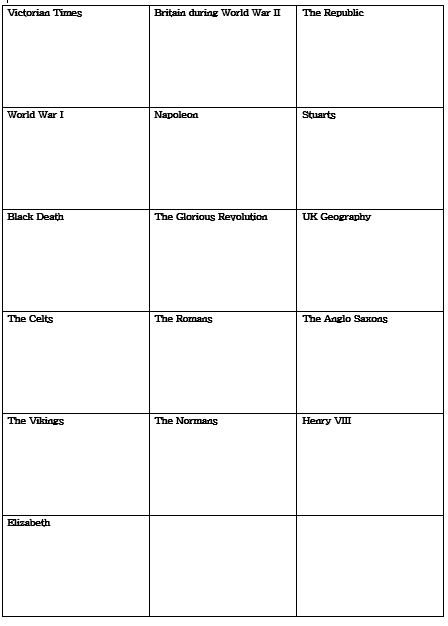 Here’s a fun way to get students sharing information, in the context of history and culture. I originally got this idea from waygook.org, which is a good source of lesson inspiration if you’re a teacher based in South Korea. 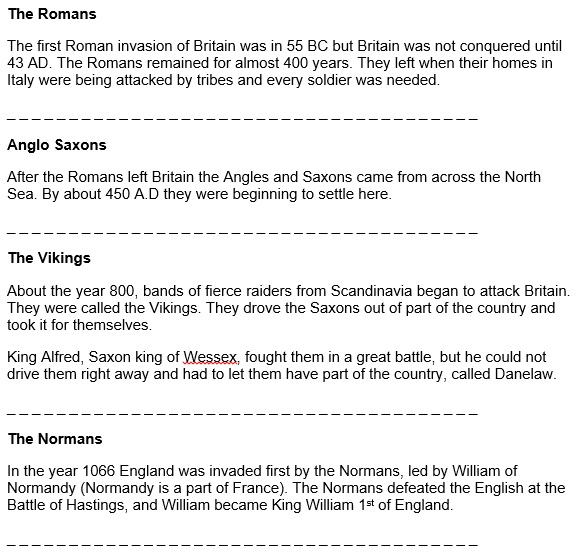 So, one student with have information on the Romans, one on the Anglo-Saxons, etc. Pre-teach any difficult vocabulary, or you could let students scan through their information and ask about any difficult terms. Give students 2 minutes (maximum) to summarise their information in NOTE FORM in the relevant box. It is a far better activity if students use notes, as when they share their information with others they can use their notes as prompts, and reconstruct sentences around them. Once they have summarised their info, take it away from them! If you have less than 16 students, you could give stronger students two pieces of information. A: what do you know about Britain? A: Can you tell me a bit about that? With the clear time limit, students know they can’t speak to each other for too long. Once they gather information about a new topic, they then have two topics to share with other students, meaning that they don’t necessarily have to speak to all their classmates. Don’t let students congregate in big groups as this will result in one person dictating to others and not as much speaking practice. Also, remind them to keep changing partners. An alternative set-up might be an inner/outer circle speaking task, with rotation every couple of minutes. After students have shared their information, pair them up randomly. Then give them a quiz based on all the information they have shared! This lesson has never failed, and always leads to some good discussions. Here are all the resources, including the information to handout, answer grid and ideas for quiz questions. As this has worked so well in the past, I’ve adapted it twice. Here is a version for anyone teaching in South Korea, based on Korean History. Here is a version for anyone wanting to teach about Queen Elizabeth II, based on information found on her official site. This one is a bit harder than the others. LOVE THIS!!! Super useful and saved me when I was in a bind! Thank you!